Coya is located on Brickell. Its specialty is “true Peruvian cuisine with a contemporary twist.” We’ll discuss Peruvian cooking along with Peruvian Independence Day, July 28. Juicy cubes of tuna with a crunchy coating of chopped walnuts are cooked on skewers accompanied by thick rings of zucchini and plump, ripe grape tomatoes. Brown rice with chopped green peppers and onions makes a quick side dish. To help the cubes of meat and vegetables cook evenly the skewers, I place the tuna on one kabob and the vegetables on another. Also, leave about 1/4-inch space between the pieces on the skewer. This way the heat can reach the sides of the food as well as the top and bottom. 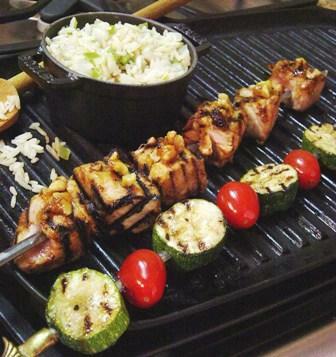 You can cook the kabobs on a stove-top grill or under the broiler. Microwaveable brown rice cooks in 60 or 90 seconds, depending on the brand. It’s a great way to serve brown rice with very little effort. If using wood skewers, be sure to soak in water for about 15 minutes before use. This prevents them burning while on the grill. Preheat the stove-top grill or broiler. Mix the jam and walnuts together in a bowl. Add the tuna cubes and mix to completely cover the cubes with the walnut mixture. Thread skewers with tuna cubes. Thread zucchini and tomatoes, alternating them, on 2 other skewers. Place skewers on stove-top grill for 5 minutes. Turn and grill 3 minutes. If using a broiler, line a baking sheet with foil and broil the kabobs 5 inches from the heat for the same amount of time. Reduce the cooking time for the tuna to 6 minutes for rare tuna. Makes 2 servings. Place onion and green pepper in a bowl and microwave on high for 1 minute to defrost. Remove from microwave. Cook rice in microwave oven according to package instructions (60 or 90 seconds for most brands). Remove from microwave and add to the onions and rice. Toss well and add salt and pepper to taste. Makes 2 servings. To buy: 3/4 pound tuna steaks, 1 small jar low-sugar apricot jam or jelly, 1 small package walnut pieces, 1 medium zucchini, 1 package grape or cherry tomatoes, 1 package frozen chopped onion, 1 package frozen chopped green pepper and 1 8-ounce package 60 or 90 second brown rice. Staples: Salt and black peppercorns. A meaty fish such as halibut or swordfish can be used instead of tuna. Pecans, almonds or peanuts can be used instead of walnuts. Finely chop walnuts in the food processor. While kabobs cook, make rice. Make Tuna and Bean Salad. Make Zucchini and tomato Salad.